Spend some time in Arusha, the safari capital of Tanzania, before heading to our campsite in the village of Mto Wa Mbu (400 km, approx 8-10 hrs). Situated at the base of Mt Meru, Arusha is the safari capital of Tanzania and there’s plenty to see and do. Kelly et moi magasinons les cellulaires … Ouf, toute une expérience…..7 gars à notre service qui nous font déplacer d’un magasin à un autre. Ensuite, on poursuit pour notre camping. A small village community, Mto Wa Mbu offers an excellent way to get a close-up look at life in an African town away from the main tourist trail. From Mto Wa Mbu, we descend to the bottom of the famous Ngorongoro Crater and make the most of our safari here – we spend between four and five hours exploring this area. 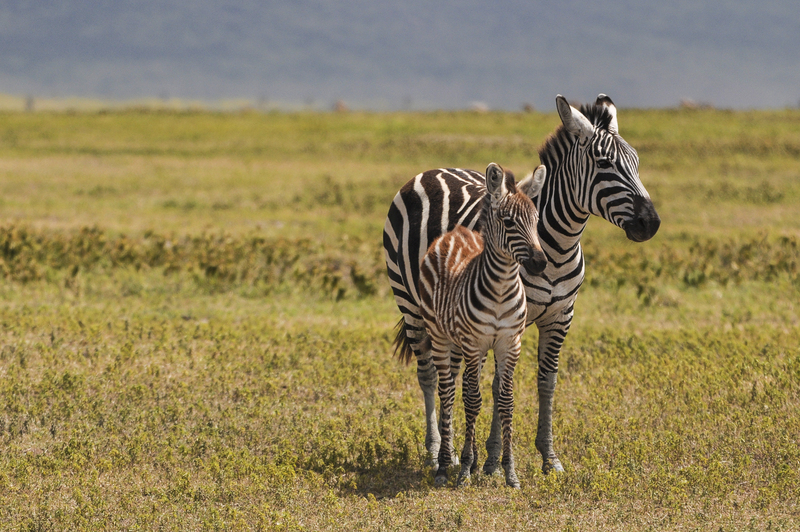 A huge, perfectly intact volcanic crater, Ngorongoro is home to some 30,000 animals including endangered black rhinos, lions, leopards, elephants, impalas, zebras and hippos. The crater floor offers excellent game viewing all year round and the photographic opportunities here are unrivalled. Wow, wow, wow….. Departing the crater in the afternoon, we head for the gates of the Serengeti and arrive at our camp in the early evening. The wide, open plains of the Serengeti – green after the rains, brown and burnt in the dry season, and home to thousands of hoofed animals and fierce predators – are perhaps the quintessential image of Africa. Flat and rolling with long grasses and dotted with acacia trees, the plains get their name from the Maasai word Siringitu – ‘the place where the land moves on forever’. Drive game….on ouvre le toit du jeep et on cherche les animaux pour les observer …. Super le fun !!!! Game viewing in the Serengeti is amazing and as you camp out at night, don’t be surprised to hear lions in the distance as you recount your wildlife sightings from the day. In normal circumstances, we would expect to see the Big Five during our stay in the Serengeti. Camping en plein cœur du Serengeti park …. Aucune clôture … Après le repas du soir, notre guide nous explique les précautions pour la nuit … Si nous devons nous lever pour aller au toilette et si nous rencontrons un animal !! Pendant notre meeting, une hyène est passée juste derrière notre guide ! Donc on va au toilette avant le dodo et on boit pas de bière de la soirée …. Non je ne veux pas me lever !!! Kelly se levait à 4h45 pour aller faire de la montgolfière, alors je me suis levée avec elle pour l’accompagner au toilette….ouf, stress et adrénaline pour sortir de la tente… Mon cœur battait très vite. Lever du soleil, morning drive … Encore parcourir le parc a la recherche d’animaux …. Fantastique…notre guide est vraiment excellent !!! Leave the Serengeti and travel back to Mto Wa Mbu. Encore a la recherche d’animaux :-))) un petit arrêt a un méga marché qui est ouvert seulement 7 fois par mois. Join the local community with a guided stroll around the farming areas – including visits to a kindergarten, milling machine, local homes and farmlands. This is a great way to have fun and find out more about the life of the locals. You’ll also have the chance to look around the town and visit the local market. J’avais apporté des crayons pour les enfants de l’école et il ne faut pas donner les crayons aux enfants directement…explication a venir… Je vous laisse un suspense !!!! Dégustation de bière aux bananes … Beurkkkkk….. Dîner typiquement africain au cœur du village et fait par les femmes sur place…une belle expérience et oui, oui je mange ….. C très bon !!!! Back on board our truck, climb high onto the slopes of Kilimanjaro to the village of Marangu, via Moshi (270 km, approx 5-7 hrs). Camp in the grounds of the Marangu Hotel, a beautiful turn-of-the-century farmhouse set in 12 acres of delightful tropical. Pluie, tonnerre et éclair pour monter nos tentes, on est tous mouillés et très sales … La terre ici est rouge…ca fait des beaux pieds !!!! Leaving the mountains behind, it’s a long travel day heading further south towards the coastal city of Dar es Salaam (560 km, approx 10-13 hrs). Once in Dar es Salaam, set up camp on a balmy beach outside of the city. Départ 5h30 …. Il faut avoir tout rangé et avoir pris un léger déjeuner !!!! Un arrêt pour dîner, un buffet typique encore miammmmm ! Catch a ferry to the ‘Spice Island’ of Zanzibar (approx 90 mins). The old part of Zanzibar’s main city is known as Stone Town. The best way to see this exotic port town is on foot, exploring the bazaars, shops, mosques, palaces, courtyards and myriad intricate alleyways. When the sun is setting, why not enjoy a sundowner from a bar overlooking the seafront before trying one of the island’s local seafood curries at one of the town’s many restaurants. Une journée très chaude environ 38-40 degré plus l’humidité …. Ouf !!! Drive to the spice plantations where you’ll receive a guided tour and the opportunity to touch, smell and taste various spices such as cinnamon, vanilla and ginger, as well as teas made with these spices. At the end of the day there will also be an opportunity to buy some of the locally grown spices. after, head to the northern beaches and enjoy white sand and sparkling blue sea – the Indian Ocean at its best. Lors du tour, dégustation de thé et de fruits :-))) lunch dans une maison communautaire fait par les femmes africaines …. Bon bien, j’ai du mangé une barre et des peanuts car le repas n’était pas pour moi, octopus avec légumes très épicés !!!! Une marche matinale sur la plage avant la plongée . 2 plongées le matin…. On a vu tortue, octopus, angelfish, lionfish, trumpetfish, shrimp, cowfish,……et plus plus :-)) Dîner avec l’instructeur dans un petit resto local, pas cher et bon. Volleyball ensuite 6-7 matchs et ensuite baignade avec les gars. 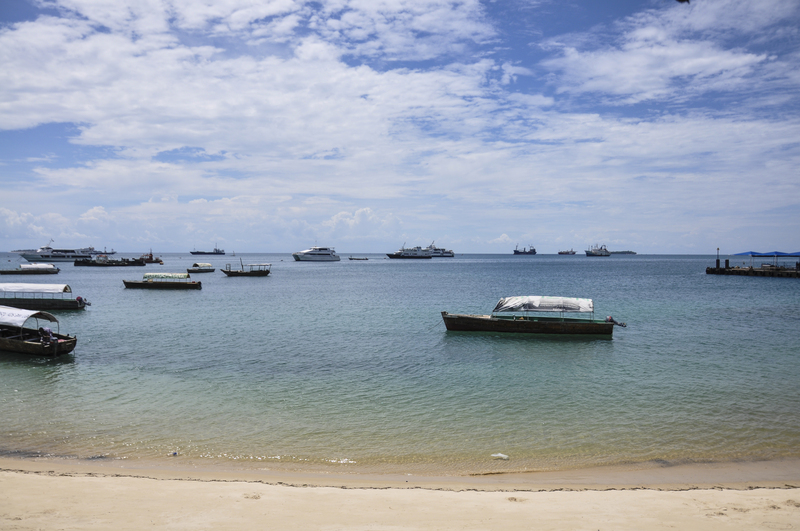 Reboard the ferry and return to the beach outside Dar es Salaam. Ferry, autobus, bateau, truck avant d’arrivée a notre camping sur le bord de la plage !! Baignade, bière, souper et dodo car demain matin départ 5h00 ! Travel further south through Mikumi National Park (550 km, approx 10-11 hrs). Situated at the foot of the thickly wooded Uluguru Mountains, Mikumi National Park is home to large herds of elephants, buffaloes, giraffes, lions and leopards. It’s Tanzania’s third largest national park. Although we don’t take an off-road safari into the depths of the park, a good selection of the wildlife that resides in Mikumi can usually be seen on our way through to the southern Tanzanian highland town of Iringa. Set up camp on the grounds of a farmhouse on the outskirts of this pleasant settlement. Très longue route…. Un ticket de vitesse car les gens de la Tanzanie sont plus sévère avec les gens du Kenya car ils croient qu’ils volent leur job car ils parlent mieux anglais. Ensuite un arrêt forcé pour laisser passer le président et sa déléguation, 40 min d’attente. Souper et dodo !!! WOW! Tu as travaillé fort pour y arriver! Profites-en pour nous tous. Ici, nous au Québec ont ce les gèles!